No more software updates. Automatic back-ups. And instant access for your professional adviser too. No wonder JACK MOORE of chartered accountants Page Kirk has become a convert to the ‘cloud’. We accountants are not exactly renowned for being at the cutting edge of new information technology. The stereotype is probably of a cautious or boring bunch. Certainly not people who are known for taking risks. It’s therefore something of a surprise to see accounting firms jumping on the cloud accounting bandwagon. Those who have started to use the software, however, haven’t looked back. So what is it about cloud accounting that makes it so much more appealing to businesses? First of all, you’ll never have to install a software upgrade again. As the program no longer sits on your local computer, all changes and updates happen behind the scenes. At the same time, all your accounting data is backed up automatically, so if your computer happened to die, you’d still be able to access the information from another device. And the same applies to your accountant. As professionals, we’re able to access your accounting data whenever we need to, without the requirement to exchange files. • the facility to set up automated links with your business bank accounts and PayPal, with the data being pulled straight into the software – helping to eliminate errors and save time. 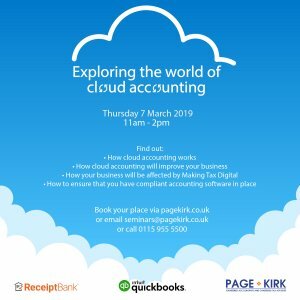 If you would like more information about cloud accounting and to find out how it can improve your business, Page Kirk are teaming up with QuickBooks and Receipt Bank to bring Nottingham business owners the ultimate guide to cloud accounting. This free event is on 7th March, 11-2pm at our offices on Gregory Boulevard, lunch and networking opportunities will be available but booking is essential. For more information visit https://www.pagekirk.co.uk/events/cloud-accounting-event or email seminars@pagekirk.co.uk.